[TimorLesteStudies] Seminar (Melbourne): Governance and Political Equilibrium in Timor-Leste: 4.00 – 6.00pm, Tuesday, 22 November 2016, RMIT University. Subject: Governance and Political Equilibrium in Timor-Leste: 4.00 – 6.00pm, Tuesday, 22 November 2016, RMIT University. Governance and Political Equilibrium in Timor-Leste: Will they survive the 2017 elections? Over the last 14 years Timor-Leste has fashioned a system of government that is rare in this part of the world, often referred to as ‘Semi-Presidentialism’. This system sees a directly elected president governing alongside a prime minister who derives legitimacy from an independently elected parliament. Based on the existence of a diarchy of powers, this system is seen by many critics as being broadly susceptible to periods of political imbalance and dysfunction, be it in the form of ‘super-presidentialism’—when presidential and parliamentary majorities coincide—or through the institutionalization of con ict as political leaders in uence the government’s agenda by securing support across various portfolios. To date, this paper argues, Timor-Leste appears to have circumvented many of the problems associated with this system by electing ‘independent’ presidents. However, how realistic is it to assume that such an equilibrium can be maintained into the future? In 2009, Xanana Gusmao, Jose Ramos-Horta and Mari Alkatiri each stressed that any assessment of the system’s virtues should only be undertaken towards the end of the third electoral cycle. This is due to occur in 2017. 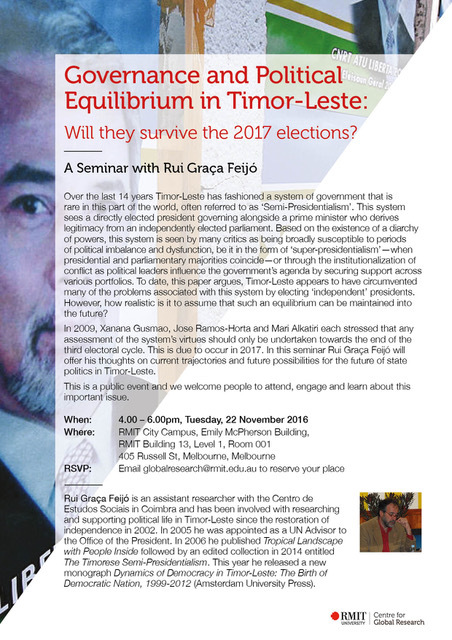 In this seminar Rui Graça Feijó will o er his thoughts on current trajectories and future possibilities for the future of state politics in Timor-Leste. This is a public event and we welcome people to attend, engage and learn about this important issue. Rui Graça Feijó is an assistant researcher with the Centro de Estudos Sociais in Coimbra and has been involved with researching and supporting political life in Timor-Leste since the restoration of independence in 2002. In 2005 he was appointed as a UN Advisor to the Office of the President. In 2006 he published 'Tropical Landscape with People Inside' followed by an edited collection in 2014 entitled 'The Timorese Semi-Presidentialism'. This year he released a new monograph 'Dynamics of Democracy in Timor-Leste: The Birth of Democratic Nation, 1999-2012' (Amsterdam University Press).